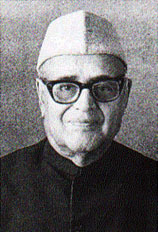 Gopi Krishna was an office worker and spiritual seeker from Kashmir who was born in 1903, and wrote autobiographical accounts of his spiritual experiences. One famous one is Kundalini: Path to Higher Consciousness . Two unlikely events led him to the practice of yoga. First, his father renounced the world to lead a religious life leaving his twenty-eight year old mother with the responsibility of raising him and his two sisters. His mother as a result pinned all her hopes for success on her only son. Second, he disappointed his mother by failing a college house examination which prevented him from attending the university. He attributed this failure to his lack of mental discipline, as he had spent his time at college pursuing enjoyable subjects and ignoring those that would be required for the examination. He felt great shame at this failure, and resolved from that point forward to live a life of simplicity and austerity. He would restrain his desires, reduce his needs, and gain mastery over himself. He rebelled against his father's choice of leaving the world, and instead chose to live as a householder and raise a family. He also adopted a routine of meditation as part of his mental discipline and practiced concentration exercises for a number of years. In spite of his religious orientation, he did not have a spiritual teacher and was not initiated into any spiritual lineage, which would have been a common practice for a religious Hindu. Over a period of years, he developed the ability to sit for a period of hours in concentration without any discomfort. The following account which took place in 1937 describes his first Kundalini experience which occurred while he was visualizing "an imaginary Lotus in full bloom, radiating light" at the crown of his head. Shortly after the initial experience above, Gopi experienced a continuous "luminous glow" around his head and began having a variety of psychological and physiological problems. At times he thought he was going mad. He attempted to contact people reputed to know something about the Kundalini system of yoga, but could find no one who could help him through this difficult period. He adopted a very strict diet which helped him maintain his precarious mental balance, and for years refused to do any meditation (since he attributed all his troubles to the yogic concentration exercises he had been doing). He was aware that a fundamental change had taken place in him after his experience of Kundalini. He believed that this experience began a process in which his entire nervous system would be slowly reorganized and transformed by the Kundalini energy that he awakened within himself. He conceived of this energy as an intelligent force over which he had little control once it was activated. Gopi spends a great deal of time describing the fear and anxiety he had in dealing with day to day events after the above experience. The food he ate and the time he ate it became like a branch which a man grasps in rushing flood waters which saves him from drowning. He also acknowledges the importance of his wife's devotion and support in helping him maintain his sanity during the decade following his first encounter with the Kundalini. This portion of his account could be described as a heroic effort to deal with something bordering on a nervous breakdown. He was required to make a perilous journey into mysterious regions of the psyche, and he found it a very difficult and drawn out process. Some would make the claim that Gopi Krishna's experiences of mental chaos and insecurity were caused by his medatative efforts, and would warn against such exploration. However many transpersonal psychologists would claim that "spiritual emergencies", "dark nights of the soul", "encounters with the shadow", shamanic sickness during tribal initiations, or descents into the unconscious are common among both indigenous and modern people. They can occur as a reaction to the use of mind altering drugs, a spiritual crisis or "call", past trauma, or any number of stressful experiences in life. Psychologists who are familiar with depth psychology see some such breakdowns as opportunites for growth and psychic integration of repressed or split off parts of the self, and a movement toward psychic or spiritual wholeness. This opposes the more common psychaitric view that such experience is only a chemical breakdown of brain functioning to be treated with drugs which alter brain chemistry. The notion that meditation can or will make people insane is far too symplistic an approach and will likely only serve as an explanation for those who have an existing bias against meditation and inner exploration in general. Gopi Krishna's graphic accounts of his experiences stand out as among the clearest journals documenting a spiritual transformation of any this author has encountered. He is honest in describing the difficulties and dangers of the spiritual path, and the intense pressure it can exert on the physical body. He is not a guru in the classical sense of one who has disciples. He is more of a seeker who later became a teacher documenting his experiences with the Kundalini energy in a number of books, in hopes of being helpful to others who encounter this extraordinary spiritual phenomena. Gopi Krishna attended conferences in the West on Kundalini Yoga and died in 1984.